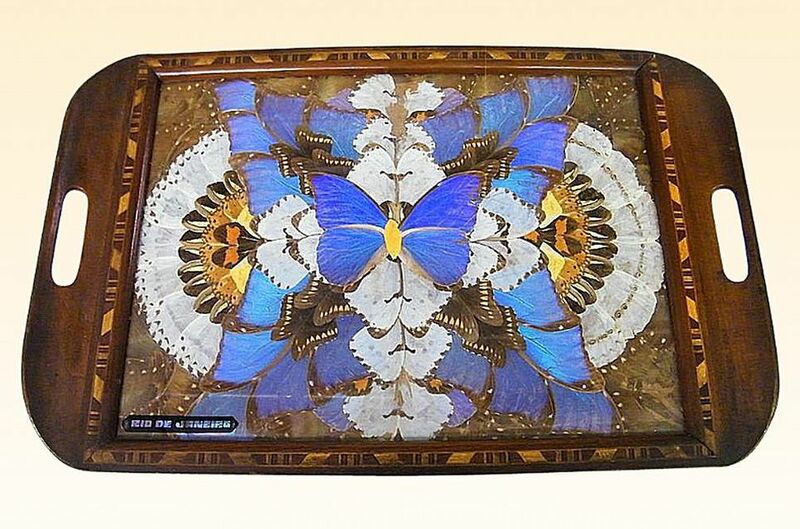 Butterfly Wing Tray, Rio de Janeiro, Brazil. It's easy to recognize the beauty of a fluttering butterfly. When it comes to collectibles, however, you've probably walked right past a picture, tray or piece of jewelry made using beautifully iridescent butterfly wings without giving them a second thought. Are Those Real Butterfly Wings? It is true, genuine butterfly wings have been used to fashion objects, many of them travel souvenirs, for decades. The Morpho butterfly, captured in South American rain forests, imparts the lovely sheen found in these collector's items, according to an article by jewelry enthusiast Janet Lawwill. The pretty peacock blue butterflies were caught by South American natives and sold to crafters for about $5 apiece back in the 1950s. They were also raised on “farms” in Europe for use in small pictures, jewelry, and other decorative objects as far back as the 1920s. Most of these items were made in England, and some still have paper tags attached indicating the origin. How Do I Recognize Butterfly Wing Collectibles? Oftentimes it's not immediately obvious when collectibles are decorated with butterfly wings because they tend to be used as a background to simulate water, sky or even cloth. The main feature of the piece is a silhouette done predominantly in black, but a little colorful accent can be part of the decoration as well. These are generally produced by a technique called reverse painting. That is, the tint is painted directly on the back of glass and then placed atop the butterfly wing background. Occasionally, however, objects will include entire butterflies. Mid-Century tray and coaster sets are an example of this type of decorative ware. What are the Most Popular Motifs? Motifs vary according to where the items were originally sold, and it seems they were retailed all around the world at one time or another. Since a good number of these items were sold in tropical tourist areas, they feature palm trees, boats, and water scenes. Other popular motifs include women dressed in period costumes, American Southwest cactus scenes, and Dutch children. When Were Butterfly Wing Collectibles Made? Most of the pictures utilizing butterfly wings for decoration seem to have been produced somewhere between the 1920s and the 1950s. Jewelry items, which include pins, pendants and an occasional ring, are still being made today in Brazil and Belize, but the newer pieces aren't as nicely crafted as the older ones. In fact, many early butterfly wing jewelry items made in England were set in sterling silver and feature fancy scroll work along the edge of the setting. These are more desirable among avid collectors. How Can I Tell if They’re Genuine Butterfly Wings? Before paying top dollar to add a piece to your collection, you'll want to make sure that you're actually getting genuine butterfly wing items rather than simulations. Some of these objects still have stickers attached to them denoting the origin of production and that they are in fact “genuine butterfly wing” pieces. Or, as seen with some jewelry items in the original box, the description will be printed on the container. If these signals aren't present, look closely at the iridescent background. If you have a jeweler's loupe, you can actually see the tiny overlapping scales indicative of true butterfly wings. Pieces that simulate butterfly wings were usually made with colored foil background and it's obvious upon close examination. With a little practice, you won't even need a magnifier to see the difference. The value of these items can vary widely. In general, older jewelry pieces tend to be more popular with collectors than the newer ones. Another aspect to consider when deciding a value is the quality of the decoration. After examining a few butterfly wing items, you'll probably notice some differences in the skill level of the artists who painted the silhouette decorations. High-quality painting adds value to your piece. And keep in mind that pieces with fading, discoloration or showing disintegration should not be valued as highly as items still holding their pretty luster. This is one area where condition affects value immensely. Most small butterfly wing pictures in excellent condition sell for $50 or less, but there are exceptions exceeding $100 depending on the rarity and desirability of the theme. Butterfly wing jewelry prices also vary. Sterling silver bracelets with charms or multiple butterfly wing links can bring $75-100, while those made of other metals with more simple designs may only bring in $25-40 in online auctions. Single charms, or small pendants, seem like a bargain at under $10 apiece. Small pins generally sell for $25-50, with older sterling examples bringing in the top range.